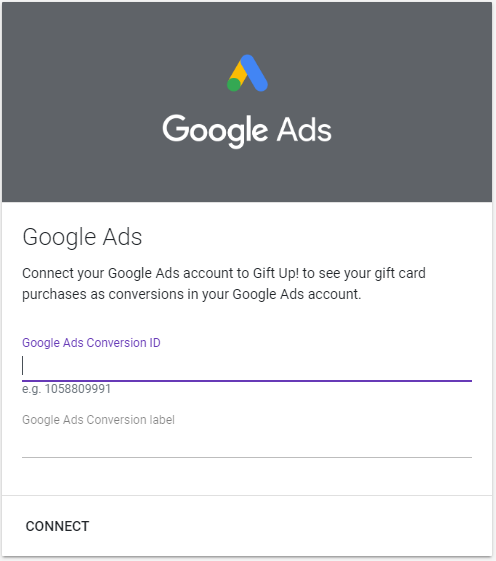 If you use Google Ads (previously known as Google Adwords), you'll want to track your gift card sales as conversions in your Ads account. To do this you will need the Conversion ID and the Conversion Label from your Google Ads account. Copy the Conversion ID and Conversion Label. Once you've saved that card, we'll fire a conversion event to Google Ads for every gift card you sell, some of these sales will have come initially from a click through from one of your Google ads and will record the conversion against that ad.